The mortgage pre-approval process can be somewhat intimidating. There’s a lot of paperwork and probably quite a bit of terminology that is a little bit foreign. Even if you’ve bought a home before, the mortgage world is always changing. If you’ll be in search of a Knoxville home for sale this year, your first starting point will be getting pre-approved for a Knoxville mortgage. 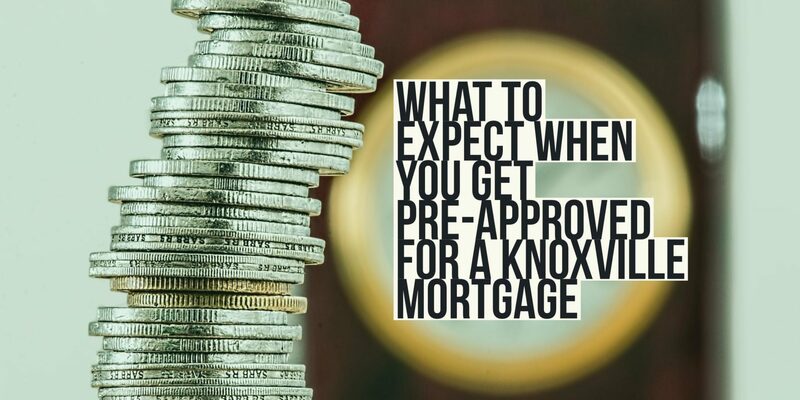 Here is what to expect when you get pre-approved for a Knoxville mortgage. A vast majority of the pre-approval process is just information gathering. A lender will want to know more about your financial situation, where you work, and will want to hear more about what type of Knoxville home for sale you were interested in. One major area of questioning when you get pre-approved involves your employment history and your income. A lender will want to see that you have stable income and employment to buy a Knoxville home for sale. They will ask you about where you work, how much income you make, and how long you’ve been employed. If your income varies due to bonuses or commission, you may be required to provide further documentation about the income. Another area that you’ll be asked about when you get pre-approved for a mortgage involves and outstanding debts you have in your name. A lender will want to know that you are not so financially stretched you can’t afford a mortgage payment on a Knoxville home. They will want to know what monthly debts you currently have like student loans, car payments, among other things. Your loan officer will also want to know more about your finances when you get pre-approved for a mortgage to buy a Knoxville home for sale. They will want to know how much money you were planning on putting down or if you have other means of a down payment, such as a gift from a family member or an IRA. When you get pre-approved, you loan officer will probably pull your credit as well. By pulling your credit, your loan officer will make sure that you’re able to fully qualify for a loan. A credit score is important to ensure that you’re able to qualify for a loan. Are you interested in buying a Knoxville home for sale? If so, please do not hesitate to let us know. Rick can be contacted at 865-696-9002 or via email at Rick@KnoxvilleHomeTeam.Com. Kati can be contacted at 865-696-1888 or via email at Kati@KnoxvilleHomeTeam.Com. Also, be sure to check out our Knoxville home search page to see what homes are for sale in the area.